This is a great project to do on the day before Thanksgiving Break. 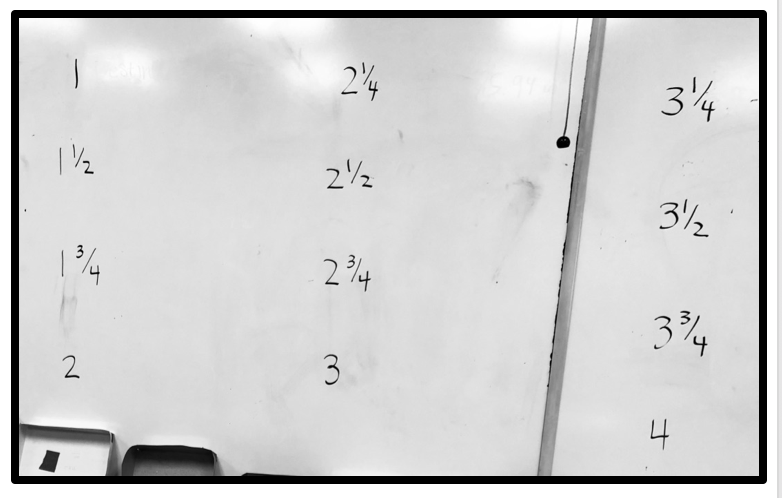 It works anytime, but it is really nice to do on a day when you need to keep the students' minds on math. I begin by having this on my board when students enter the classroom. Students immediately want to know "what's that for" and "are we having a quiz?" (Eye roll!) But at least they are paying attention to their surroundings and I am generating interest in the day's lesson. I have students choose a partner and then sign their name next to one of the (what will turn out to be) measurements on the board. 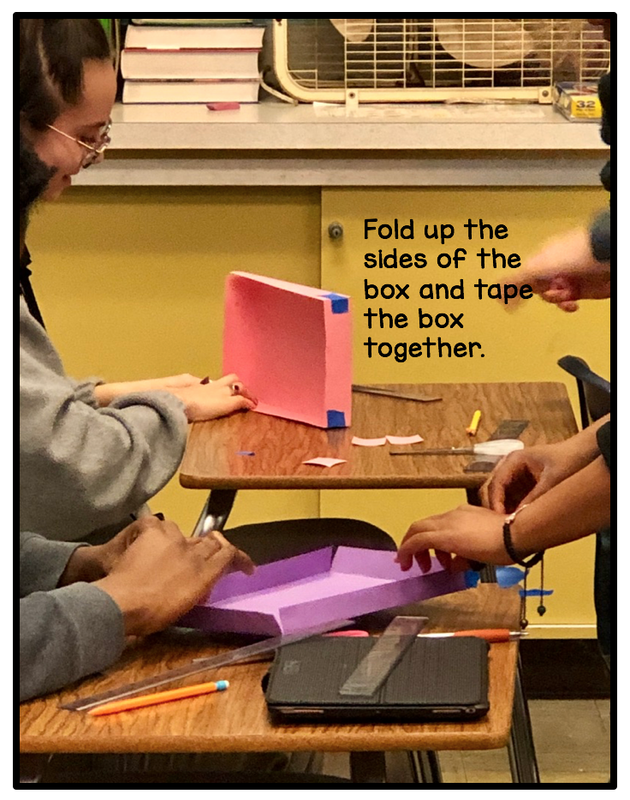 I explain to the students that we are going to make boxes out of their piece of construction paper. 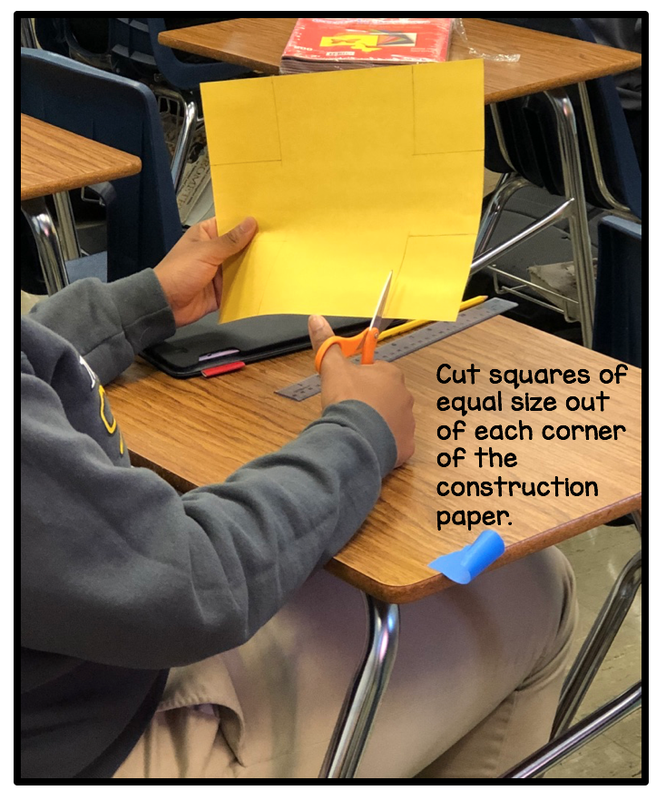 They cut squares of equal size out of each corner of their sheet of construction paper. 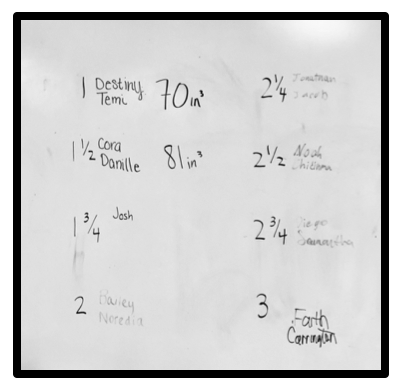 Each group uses the measurement next to their name on the board in the front of the room. 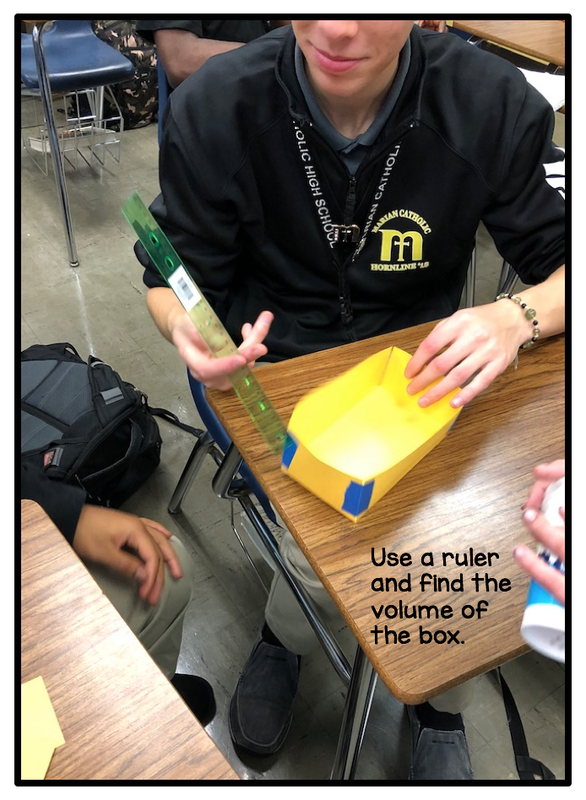 After students cut the paper, they fold up the sides of the box and tape them in place. Once their box is made, each group calculates the volume of their box. 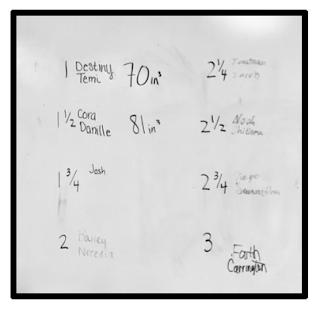 I have each group write the volume that they calculated next to their names on the board. Once all of the groups have written their volumes on the board, we look to see which measurements will give the maximum volume of the box. Then we figure out, using algebra and the calculator, exactly where and what the maximum will be. The construction paper that we use is 9 inches x 12 inches. Students use these measurements to come up with a formula that will represent the volume of a box that can be formed if squares with sides of length x are cut out of the corners of the construction paper. This graph is generated. We talk about the graph and realize that for this particular situation, we only want to use the part of the graph between x = 0 and x = 4.5. [squares larger than 4.5 cannot be cut out of the paper]. Of course, none of this actually involved any calculus. 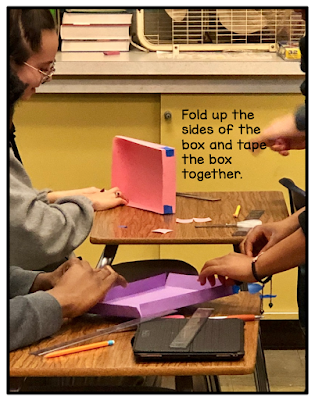 I use this entire activity as an introduction to the idea that we can all start with a given constraint - in this case the piece of 9 x 12 construction paper - and generate different solutions to the problem - in this case make a box. Which one is best? 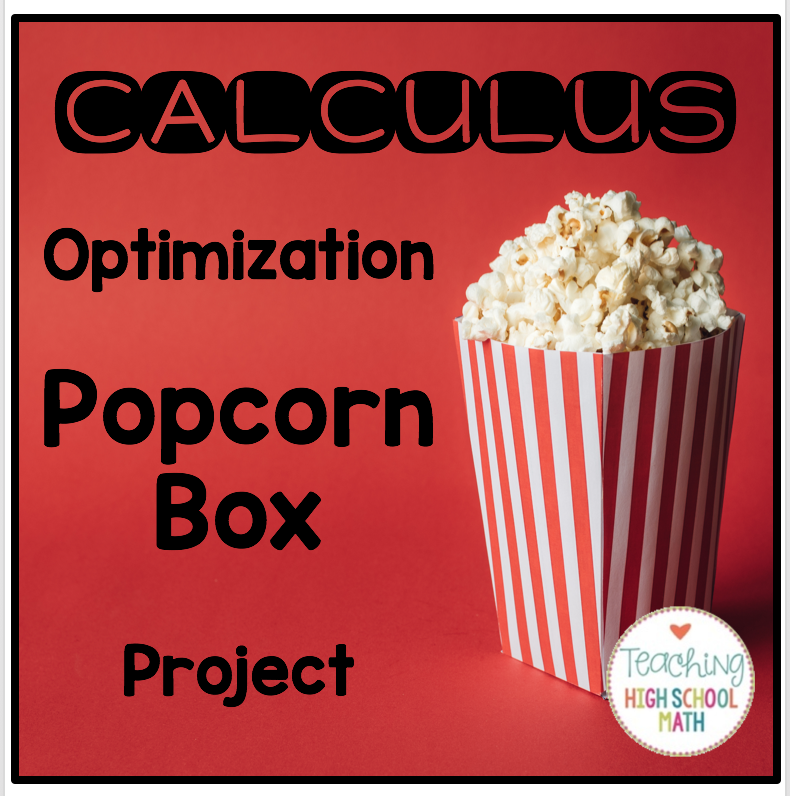 Then we talk about different types of optimization problem situations - I specifically bring up whether pop is in the most cost efficient container. I actually have a coke "can" in the shape of a (sort of) sphere that Coke put out several years ago for Christmas. Or, Dr. Pepper, made a special edition "can" in the shape of a football several years ago for the beginning of the football season. After our discussion and calculator work, students get to fill their box with popcorn and eat! Hi Jennifer, I love this lesson. First off, I like how the students react when they walk in, it is a great start to a class when the students are paying attention and are interested in what is about to come. I also like how there is actually no calculus involved. This is a great introductory lesson to the realm of optimization as the students are just applying their algebra knowledge to this concept. I also like your discussion you had at the end about real life applications of this in day-to-day scenarios. Thanks for this idea, I can definitely see myself using it.